Winterthur — ‘Images of and by women throughout the centuries’: it’s a promising title for a show about pictures of women. It is no secret that, throughout history, most works of art about women were made by men, with the result that those images of women are solely from a male perspective. To address this imbalance the Kunst Museum Winterthur coyly tries to bring works about women by men and works about women by women from its own collection into dialogue. The most striking first impression of the exhibition is the number of works on display by old (male) masters and male artists well into the 20thcentury. More than three quarters of the exhibited works of art are images of women as most of us know them, through the male gaze. From the walls of the attic of the museum, where all their contemporary and temporary exhibitions are situated, femme fatales, Marias and muses look back onto the observer. The opening text in the dimly lit room advertises big contemporary names like Pipilotti Rist, Sylvie Fleury and Nan Goldin and promises artistic interventions by modern women that challenge the way their gender has been depicted throughout the centuries. But the intervention doesn’t succeed. One work by Rist, two by Fleury and other isolated works by contemporary women are not successful in entering into dialogue with the flood of naked women on the walls. 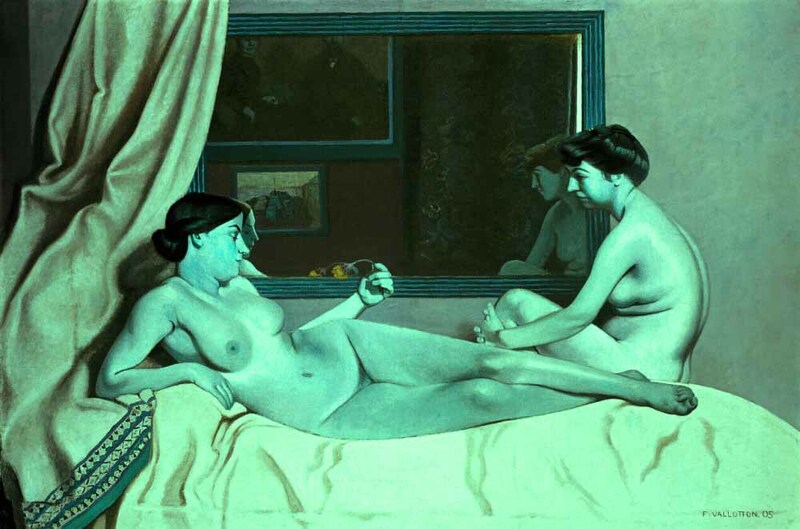 The works by the contemporaries are certainly humorous, but Allure Chanel Elite, a pile of old shopping bags by Fleury, cannot hold its own against Félix Vallotton’s bare ladies in Le repos des modèles. One might ask which approach of portraying women is preferable, but the one-dimensional shopping avalanche definitively does not do justice to most women. The provocation backfires and the expectations of meaningful collaboration between old and the new and male and female portrayal of women are not met in this exhibition that could only be housed in the dusty, poorly lit attic of a museum that has ample space to give today’s women artists adequate room for their works. Instead it becomes clear that the Kunst Museum Winterthur does not focus on collecting and supporting contemporary women artists. The Kunst Museum Winterthur wants to join the current discussion about gender representation without actually offering a platform for either emerging or successful female artists. Der vorliegende Text entstand im Mentoringprojekt des ZHdK Master Kulturpublizistik und des Kunstbulletin mit den Mentorinnen Claudia Jolles und Aoife Rosenmeyer. Er erschien erstmals am 19. Juni 2018 im Kunstbulletin.